For many decades, William Hill has been a leading name in bookmaking throughout Europe. Maintaining their traditions of consistency, fairness and stability, their poker room - William Hill Poker - adheres to the high standards of this powerful brand. With strong site traffic, many generous freeroll opportunities and satellites to many major tournaments, even low stakes players will enjoy what William Hill Poker present. William Hill Poker runs on the iPoker network, which powers dozens of major poker sites, including most of the bookmaker-branded rooms. William Hill Poker have been a player in the online poker industry since 1998 and are certainly a brand who have remained solid throughout many turbulent years in the industry. As the room carries the name of one of the world's most power bookmakers, their stability is hardly surprising. Your funds are definitely safe at William Hill Poker. 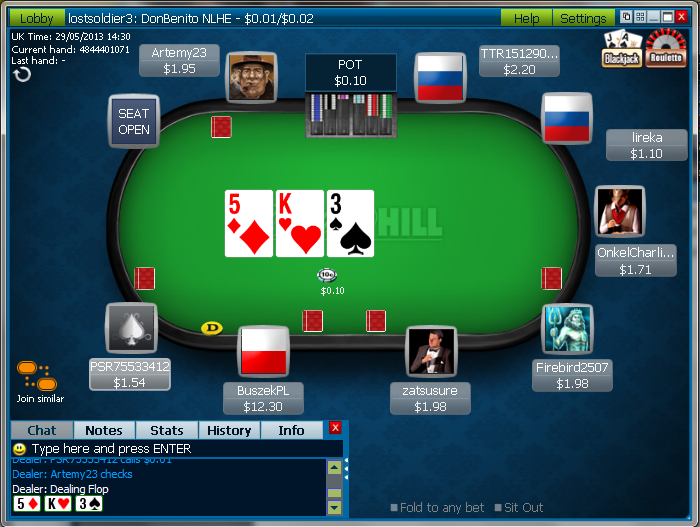 As with all iPoker rooms, the William Hill software is exceptionally light-weight and well designed. The poker tables are especially clean, with large action buttons and a very easily-used bet slider. On the left-hand side of the lobby is a menu system which allows easy navigation between ring games, tournaments, SNGs and more. After selecting your desired game type from the primary buttons, secondary menus appear; allowing greater filtering. There is also a custom filter in the lobby to select games according to your preferences of turbo/non-turbo and buy-in levels. From this writer's experience, the William Hill Poker tables are filled very poor players at the lower levels. A reason for this must be that William Hill poker players are often transients from their sportsbook looking to recoup betting losses or simply trying to learn the game from scratch. SNGs and tournaments are particularly soft on William Hill, whereas the lower levels of ring games often play quite nitty and require some aggression to profit consistently. 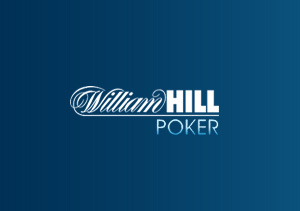 William Hill Poker runs the standard iPoker style VIP scheme. As a person plays more frequently and pays rake and tournament fees, their VIP level increases. At each new level, the rate at which you accrue William Hill points multiplies, allowing more rapid access to the next level. William Hill Poker points can be exchanged for cash, or used to buy-in to various tournaments. There are also generous VIP freerolls for players who reach each level of the loyalty scheme, with weekly and monthly events with prize pools ranging from $500 to $5000. William Hill Poker excel in providing great tournaments. At the freeroll level, regular sports betting and casino players are rewarded for their loyalty with weekly and monthly events. William Hill also run a weekly Facebook Freeroll, which pays out tickets to the William Hill Super Series. This excellent continuous tournament series has events with buy-ins ranging from £1.50 to £25 with guarantees as high as £5000. With slow structures and medium-sized fields, these tournaments are perfect for the MTT connoisseur. William Hill Poker also have daily and weekly guarantee tournaments, with the Friday $50,000, Saturday $30,000 and Sunday $200,000 being particularly juicy ones. For the single table grinders, William Hill Poker spread a full range of SNGs. Buy-ins are as low as $0.10 for some of these, so there are always opportunities to recover a flagging bankroll. Turbo, super turbo and slow options are offered to suit every speciality. The William Hill Poker School presents a basic amount of information, aimed mostly at beginners. Tips to be found include hand match-up probabilities, basic strategy guides and rules. Experienced players will find nothing worth exploring here, but will take solace in the fact that William Hill are clearly seeking to entice rookies into their tables. A new feature of the Poker School is an interactive poker quiz. Although William Hill Poker does not come close to Pokerstars in traffic, a sustained player base of 6,000 to 15,000 populate the site throughout the day. Interestingly, this seems well-spread through ring games, tournaments, SNGs and every stake level. There is even a solid amount of high stakes action, particularly in the heads-up tournament and heads-up cash arena. Debit card, credit card, PayPal, CashDirect, Skrill, NETELLER, ukash, paysafecard, clickandbuy, EntroPay, CLICK2Pay, Kalibra, Bank Transfer, Cheque.